Important Note: This is the archived version of the 2013–2015 Undergraduate Catalog. The information on these pages was archived on August 6, 2013 and will not be updated as requirement and/or program changes are approved. Please see www.uic.edu/ucat for the most up-to-date requirements. Academic Advisors: Professors Jun Cheng, Michael Cho, Yang Dai, David Eddington, Hananeh Esmailbeigi, John Hetling, Dieter Klatt, Miiri Kotche, Jie Liang, Andreas Linninger, Hui Lu, Ao Ma, Ali Mansoori, William O’Neill, James Patton, Richard Magin, Thomas Royston, and Christos Takoudis. The Department of Bioengineering offers a program of study leading to the degree of Bachelor of Science in Bioengineering that is accredited by the Accreditation Board for Engineering and Technology http://www.abet.org/. Bioengineers are uniquely qualified to work at the interface between living and nonliving systems, enhancing our ability to analyze, repair or replace physiological substances or processes as needed in healthcare and research applications. Potential applications include creating engineered bone replacements, developing new tools for noninvasive imaging or diagnostics, and the design of molecules as new therapeutic drugs. Training in bioengineering prepares students for graduate school or industry, and is an excellent preparation for professional programs (medicine, dentistry, nursing, pharmacy). Exciting career opportunities exist for bioengineers at the BS level in biotechnology, pharmaceutical and medical device industries, in hospitals, federal labs, and environmental agencies. The department faculty routinely includes undergraduate students in world-class bioengineering research programs, and maintains strong interactions with faculty in the Colleges of Medicine, Dentistry and Pharmacy, the Department of Biological Sciences, and other engineering disciplines. The undergraduate curriculum includes rigorous training in bioengineering fundamentals, including medical product development, complimented by significant course work in physiology, mathematics and chemistry. Each student must complete a program of required core courses and select an individualized course track in one specialized area (Neural Engineering, Cell and Tissue Engineering, or Bioinformatics) best suited to the student’s interests. The department offers several elective courses to help prepare students for a variety of career paths, including launching start-up companies or careers in industry or consulting. 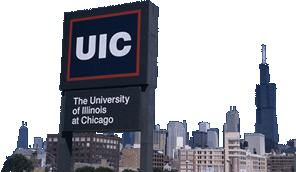 The department Mission Statement and the Educational Objectives for the Bachelor of Science in Bioengineering can be found at the departmental website http://www.bioe.uic.edu. To earn a Bachelor of Science in Bioengineering degree from UIC, students need to complete University, college, and department degree requirements. The Department of Bioengineering degree requirements are outlined below. Students should consult the College of Engineering section for additional degree requirements and college academic policies. a This course is approved for the Analyzing the Natural World General Education category. b Students should consult the General Education section of the catalog for a list of courses in this category. a ENGR 100 and 189 are one-semester-hour courses, but the hour does not count toward the total hours required for graduation. A minimum of 3 hours must be upper- division (300- or 400-level) bioengineering or other engineering courses, excluding courses in the ENGR rubric. Nonengineering courses may be used only if they can be justified and prior approval is obtained from the advisor. A maximum of 3 hours of BIOE 398 may be applied as concentration area elective hours. A maximum of 4 hours from the following courses may be applied as concentration area elective hours: BIOE 402, ENGR 400, ENGR 404, and ENGR 420. The following web-based courses may not be applied as concentration area electives: ENGR 401, ENGR 402, and ENGR 403.
a ENGR 100 is a one-semester-hour course, but the hour does not count toward the total hours required for graduation.